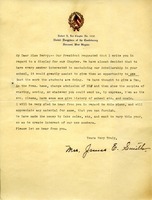 Thank you letter for DAR gift. 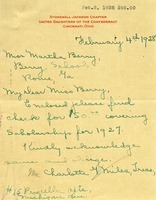 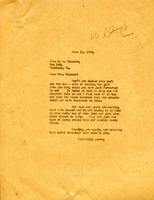 Charlotte writes to Martha with a check for fifty dollars to cover scholarships in 1927. 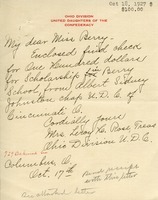 Mrs. Rose encloses a check from Albert Sidney Johnston for $100 to be used as a scholarship for the Berry Schools. 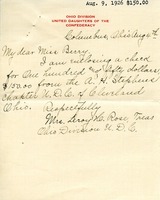 In this letter Mr. and Mrs. Leane send Martha Berry five dollars from the Wade Hampton Chapter of the United Daughters of the Confederacy. 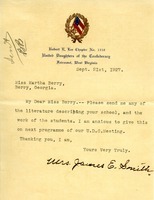 Mrs. Smith asks for Miss Berry to send some literature on the schools to her. 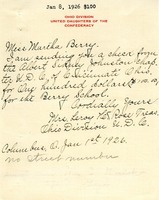 Mrs. Smith requests an event to promote participation in the United Daughters of the Confederacy chapter at Berry. 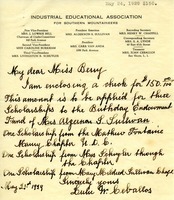 Such an event woudl include showing the work of students and holding a fundraiser. 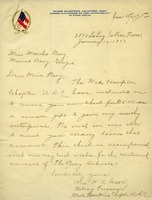 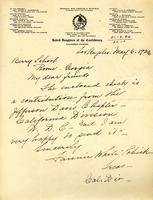 Fred K. Hoehler writes to Martha Berry on behalf of Mrs. J. C. Hosea of The Stonewall Jackson Chapter U.D.C. 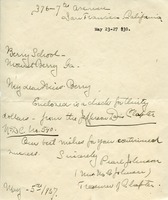 to make sure that the fifty dollars the chapter annually sends to the Berry Schools is used for the admission of a boy, not for the general fund. 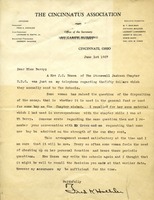 On Cincinnatus Association stationery.